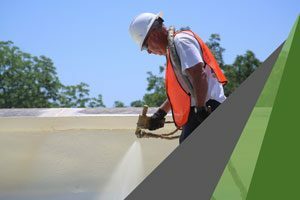 At DFW Urethane, we firmly believe that an SPF (spray polyurethane foam) roofing system is the best option for the majority of commercial buildings — both those in need of a solution to their current failing roof and new constructions. Here are 5 reasons why we’re sold on spray polyurethane foam roofing systems, and why you should be, too. 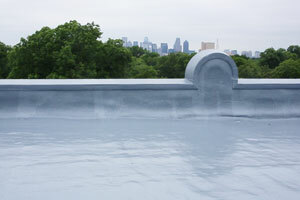 A spray polyurethane foam roofing system is sprayed on one coat at a time. It’s self-flashing, adhering to the surface and conforming to the shape and features of the roof, making it great for flat, pitched, or dome roofs. Also, there’s no need to remove all the HVAC and utility fixtures when installing the new roofing system or applying a recoat. Do you currently have an outdated, damaged, or leaky roofing system, like tar and gravel, metal, wood, modified bitumen (mod-bit), or an aging TPO roof? An SPF roofing system can be applied right over the top of your old system without a costly and time-consuming teardown of the old roof. Additionally, you probably won’t need to close your business, meaning little-to-no loss of income — a potentially huge savings. North Texas has some incredibly severe weather that can do major damage to your commercial roof — with just a conventional roofing system, the weather can lock you into a cycle of constant repairs. Spray polyurethane foam roofing systems are far more able than other conventional flat roofs to withstand impact damage from hail or flying debris, and SPF roofing systems stand up well to wind and intense rain. Their tough, thick, seamless construction is extremely durable. In addition, SPF can stretch as your building naturally expands under intense heat and sun — it’s also able to contract with your building as it cools at night. Leaks don’t occur because there are no weak seams to crack or split. 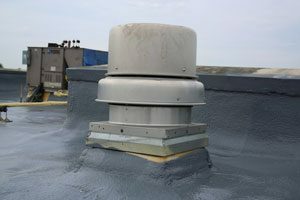 Since the foam roofing material is sprayed on, it forms a seal around any utility fixtures or HVAC ducts, those weak areas in conventional roofing systems where leaks often occur due to weather damage. All of that strength comes in an extremely lightweight package, making spray polyurethane foam roofing systems ideal for new constructions and old roofing systems alike. SPF roofs have less weight to support compared to traditional roofing materials, requiring less structural steel. There’s one more thing — contrary to popular belief, a person carrying even a heavy load can walk across an SPF commercial roof. The SPF roofing system, with its seamless construction, forms an envelope with your SPF insulation. This water- and airtight seal prevents the loss of the air you pay so much to heat and cool. SPF was originally used in refrigerator and freezer systems, and it has an extremely high R-value per inch. SPF roofs are generally highly reflective, having a lighter color than traditional tar and gravel or mod-bit roofing systems. SPF alone possesses increased reflectivity, but it can be drastically improved by adding an elastomeric roof coating (read more about the GE Enduris Roof Coating System here). Over a 30-year period, studies show that an SPF roofing system can save anywhere from 10-50% on utility costs. Let’s talk about the environmental benefits of foam roofing systems — there’s a lot more going on here than just the increased energy efficiency we’ve already discussed. Since the foam roofing material is applied as a sprayed liquid over a previous, failing roof system or is reapplied to increase its effectiveness, there is no mass of torn-out material to add to the local landfill. Any excess material can be safely disposed of since it contains no formaldehyde or other substances known to harm the ozone layer. Spray polyurethane foam roofing systems have practically no “lifespan.” Once in place, they don’t age or deteriorate much, and can be repaired fairly easily with little expense. By adding an elastomeric coating, the lifespan is further increased, and the GE Enduris Roof Coating System can add up to a 20-year warranty to your roof. There’s still much more we could say about why spray polyurethane foam roofing systems are superior, but we’d rather show you in person. Click here to schedule a free estimate on a spray polyurethane foam roofing system — it can solve a lot of problems and save you a lot of money.